Yesterday was quite an event here at GSF! We had hundreds of visitors as we celebrated God's work through the ministry over the past 20 years here. It was a very encouraging time in many ways. As our current director spoke, he shared about the work that is now going on all over Uganda through kids who grew up at GSF, and are now adults serving The Lord. There are ministries to street children, ministries to young women in the streets, schools, churches, other children's homes, music ministries and more, all begun by children who were orphaned or abandoned, who now are living out the grace they have received. I was overwhelmed to hear of the multiplication of this ministry through the children who grew up here. Praise God for his work through this ministry! The program included speeches, musical performances and testimonies throughout the day. There were several Ugandan officials who came and spoke in addition to former directors, someone from Global Outreach, and many others. 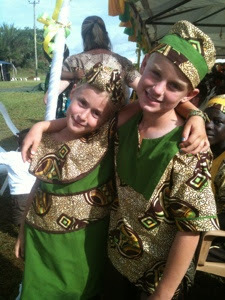 Our oldest two kids also performed several songs with the GSF kids in the Hosanna Children's Choir. We have been praying for Esther who had been struggling a bit with singing in Luganda and dancing at the same time, but she did great! I was so happy for her. Elijah has also been doing a wonderful job and was even given a brief solo which he sang well in two languages. They have been practicing quite a bit, and I was grateful that it all went so well. The guest of honor for this event was Wayne Walker, pictured above. He and his wife Bonnie Sue founded GSF 20 years ago. They flew to Uganda with their, at the time, 6 adopted children all under the age of 4. (They have now adopted and mostly raised 13 children from all over the world!) Bonnie Sue passed away a few months ago, and many were sad that she was not able to be here, but Wayne pointed out she is celebrating God's kingdom in heaven! Wayne shared some stories from the early days of GSF when there were many children and how God provided this land that we are now on through Samaritan's Purse. He also told the story of how God brought him through losing his legs in Vietnam as a 19 year old. 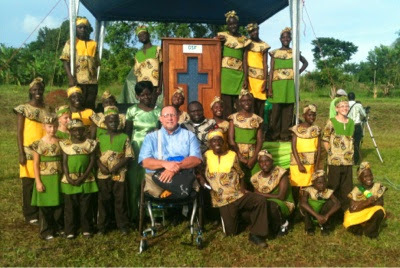 He shared how he has used his disability payments to start the ministry at GSF and adopt so many children. What a beautiful picture of God using all things for good! If anyone in the audience was struggling to believe that God could use them in their weakness, this testimony would have been an amazing encouragement! He said his one regret is that his faith was not stronger to take in more children. Wow! While it is amazing to see what Wayne and Bonnie Sue have done, Wayne was quick to point out that all of this is not about what man can do. This is what God has chosen to do through his people. We are thankful that God has given us the privilege of helping continue the work God has begun here at Good Shepherd's Fold.